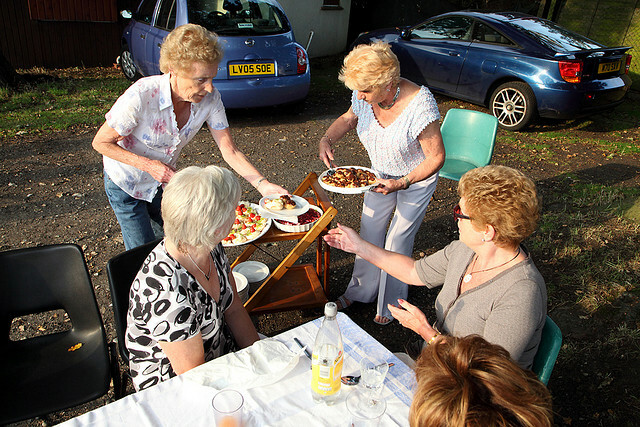 The season is at its height for barbecue get-togethers with friends and family. We should all make a promise to ourselves to attend or throw at least one before the end of Labour Day weekend. It's a great way to show the people who love you that the feeling is mutual. The biggest part of the fun of a backyard barbecue is the grilling, of course. It quickly becomes a group activity as people come forth with their “helpful hints,” best-ever sauces and stories of barbecue adventures past. 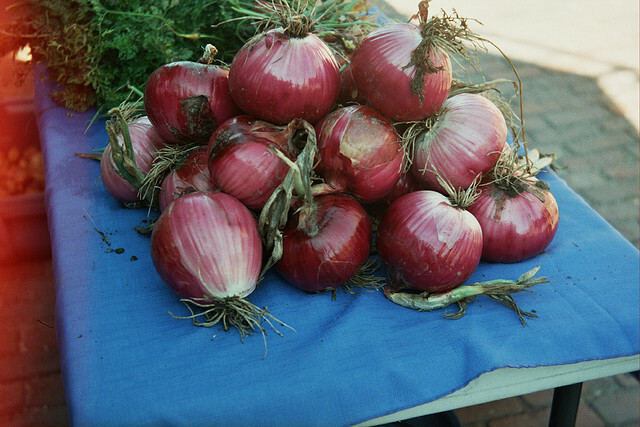 A common afterthought of barbecues, though, is often what we serve with the steaks or burgers or shrimp, etc. I often wonder why we often just opt for plain potato salad when many other recipes are better for you and take less time to make. Unless you burn your meat, your side dish choices can make or break a memorable affair. Red onions are less sharp in taste than common yellow onions. Salads are favourites for barbecue side dishes. The beauty is that most can be made in advance, and many salads even taste better after chilling. Making salads ahead means you have the time to put your feet up and enjoy your company instead of watching the festivities from the sidelines (kitchen). Salads are favourites because they can be so diverse; they can be potato, pasta, fruit, bean, green, or gelatine salads, and don't forget the coleslaw. All have infinite variations. This fresh vegetable salad recipe is an interesting combination of ingredients. 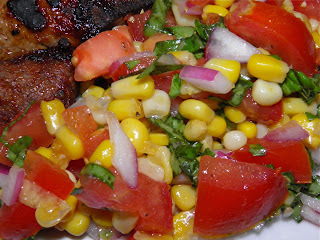 The red onion, corn and tomatoes are nicely complemented by basil, and lemon juice gives it all a fresh, tangy taste. As the recipe states, you can use sweet fresh corn right off the cob, but – being lazy — I used canned. I also don't like the mess of removing kernels from cobs. Whatever you do, don’t use cream style corn. Kernels only for this recipe. I think you will like this. It's a great accompaniment and very "summery." The recipe can easily be doubled or tripled if you’re making it for more than a small group. Drain the corn kernels (if using canned) and place in a bowl. Chop the tomatoes into small(ish) dice and add to the corn. Shred the basil and add in. Sprinkle with salt and pepper. Squeeze the lemon juice over top and then pour on the olive oil. Toss all to combine. Let sit to meld the flavours or refrigerate overnight. Thanks for the addition in my stocks of bbq recipes. I have tried Italian, French and Spanish dishes at home whenever bbq parties throw out by my husband. You are a big source to get new idea. Please keep bringing.